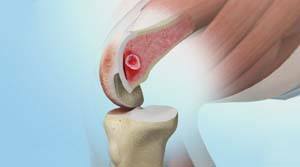 What are Bone Marrow Lesions? A semi-circular reference frame is placed relative to the individual patient's tibia or shinbone. The semi-circular frame allows the surgeon to target the internal subchondral location of BML from a range of trajectories. A pin is inserted through the skin to the bone under fluoroscopic imaging using this semi-circular frame.